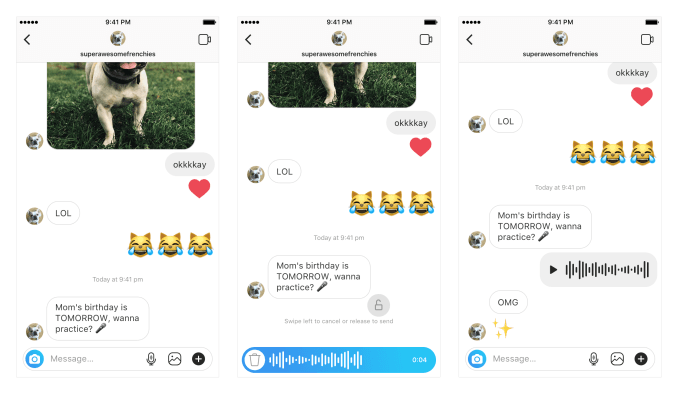 Introducing voice messaging for Instagram! Today, 5 years after Facebook first introduced voice messaging on their chat app, the new feature will be rolled out globally to Instagram users. Voice messaging is great for when you want to add a more personal touch to your direct messages or when you don't have both hands free to type. It should also be a welcome addition for those whose languages are more difficult to type. To use this new feature, simply hold your finger down on the microphone icon to record up to 1 minute of audio. Once you release your finger, the message will send automatically. You can, however, swipe left while your finger is still on the screen to cancel the message. Once it's sent, your voice message will appear as an audio wave in the chat. Voice messaging works in both one-on-one and group chats, and it does not disappear after the recipient listens to it or after a set period of time. Instead, it stays permanently in the chat. Coming on the heels of Instagram's descriptive text update aimed at improving the app for users with visual impairments, Instagram's newest feature is just one more way that the Facebook-owned company is striving to make its platform more accessible for all users. This update will also make the app more competitive with other major messaging apps like WhatsApp, Facebook Messager, Zello, and Telegram that already have voice messaging capabilities. Hey Buddy!, I found this information for you: "Voice Messaging is Now Available on Instagram". Here is the website link: https://mikespeer.com/voice-messaging-is-now-available-on-instagram/. Thank you.